Donations/Fundraising - Holyland Donkey Haven Inc.
Did you know you can raise funds for Holyland Donkey Haven just for using your computer? Holyland is a member of iGive - and when you register and use their site to shop online or complete web searches, they donate to Holyland on your behalf! 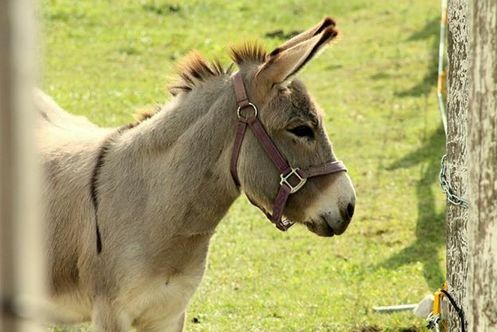 In addition to tax-deductible cash donations, we appreciate receiving items that can be used to support the operation of Holyland Donkey Haven. You can either make an appointment to donate items or you can go to Amazon and pick something off of our wishlist. As a 501c3 charitable organization, your gifts are tax deductible to the full extent of the law. Remember, every donation you give helps us to save donkeys and educate people! We'd like to thank the benefactors that keep Holyland open! Thank you to those who have donated to assist in supporting us! ​From all the staff and residents of Holyland, we give you our most heartfelt thanks! Our Goal for 2018: We would like to raise $7,000 to fund surgeries for Ferguson and Wilson who are currently disabled. Many thanks and much appreciation to the ASPCA for their generous award to Holyland Donkey Haven of a 2014 grant in the amount of $500! The funds from this grant will be used to assist in purchasing clean, quality hay to nourish the Donkeys in our program!